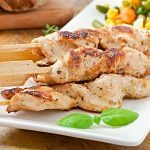 0-10 mins: Combine dried marjoram with chopped garlic, tomato paste, coconut oil, salt and pepper and rub over chicken tenderloins skewered on bamboo sticks. The sticks are optional, you can simply marinate chicken strips. Set aside for for a few minutes. Place a saucepan of water to boil. 10-20 mins: Heat a little coconut oil in a large frying or grill pan. 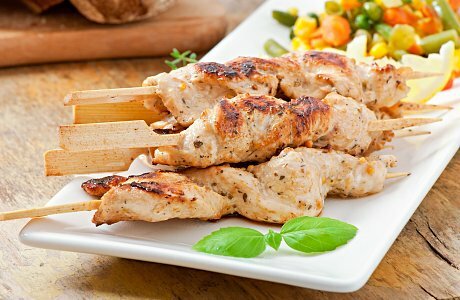 Cook chicken skewers or strips for 3-4 minutes on each side. At the same, cook broccoli in boiling water for 2-3 minutes and mix rocket salad leaves with lemon juice and extra-virgin olive oil. Toss cooked broccoli with little salt.